NEW STOCK JUST ARRIVED AND IN STUNNING CONDITION. FINISHED IN METALLIC 'THUNDER' GREY PAINTWORK WITH A GLOSS BLACK ROOF & WHEELS. 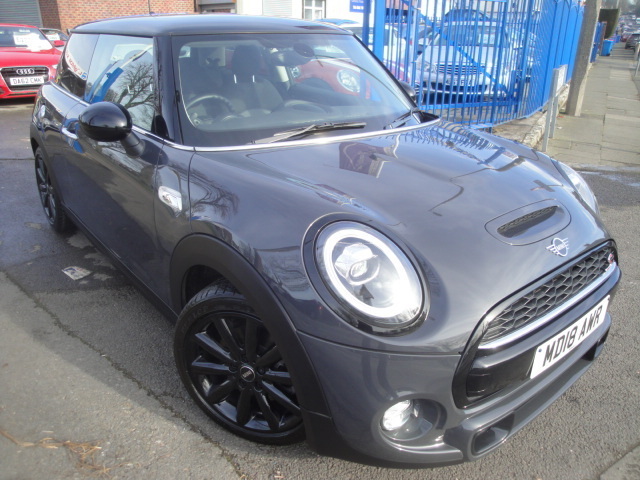 THIS MINI COOPER S HAS THE NEW 2.0 ENGINE FROM BMW ALONG WITH THE BRAND NEW TWIN CLUTCH 7 SPEED AUTOMATIC GEARBOX AND DEVELOPS 192 BRAKE HORSE POWER AND AS A RESULT IS TRULY SUPERB TO DRIVE. THE CAR ALSO HAS PART LEATHER INTERIOR, HEATED WING MIRRORS, FACTORY FITTED SAT NAV, BLUETOOTH TECHNOLOGY AND A JOHN COOPER WORKS STEERING WHEEL WITH MULTIFUNCTION INCLUDING CRUISE CONTROL AND STEREO/SAT NAV CONTROLS. THIS CAR IS JUST 6 MONTHS OLD AND HAS COVERED JUST 6500 MILES, THE MILEAGE HOWEVER WILL GO UP SLIGHTLY AS THE CAR IS IN DAILY USE BY OURSELVES.